We hope you’re ready for some more Pac-Man 256 tips and tricks, following our first guide, because this is such an iconic and classic game series it deserves a really comprehensive list of such. 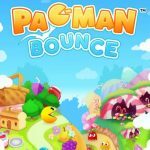 Just to remind you about this game, it offers a twist on classic Pac-Man in many ways, including the addition of power-ups – all 16 of them. 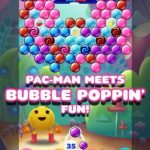 This is a Bandai Namco game for Android and iOS users, and the company does make sense when it says Pac-Man 256 is “reinvented for your mobile phone or tablet.” However, your ultimate goal in the game is to defeat that evil Glitch after all. We do hope that this second in a two-part Pac-Man 256 strategy guide serves you well, because simple as this game may be, we should warn you that there are twists aplenty you have to watch out for. Assuming your current ability comes from a power pellet, then all the other pellets will retain their current state, meaning you can keep eating them (even if they aren’t white cubes) in order to keep your power meter going and extend the duration. It’s also a good idea not to eat a second power pellet just yet if your power meter is close to full. You don’t want to waste these pellets and their efficacy, after all. Then again, waiting till the first pellet expires will kill off all ghost multipliers, so it’s important to have a balanced strategy when it comes to these pellets. We talked multipliers in the first part, and fruit is, without a doubt, the most essential one. Eating some fruit will give you a multiplier for all other actions, and depending on the fruit you eat, you can really rack up the points in a hurry. This is especially true when taking care of ghosts. Eating three ghosts with a regular pellet earns you 60 points, while doing the same while you’ve got a cherry multiplier increases that to 120. Just think how good it would be if you’ve got the green melon multiplier, because that’ll give you a total of 360 points! The mere act of eating fruit will give you points equivalent to their multiplier times 30. Cherry is worth 60 points, apple worth 90, strawberry worth 120, orange worth 150, and green melon worth 180. 3. What Do The Ghosts Do? 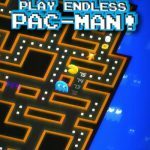 There’s a total of eight ghosts in Pac-Man 256, and here’s a list of the different things they can do…or can do. Blinky (red) is the ghost that you need to be most wary of, as he’s probably the most determined to get Pac-Man. He makes smart turns in the board, usually going for the shortest cut towards hunting down Pac-Man. In terms of speed, we’d say Blinky has similar speed to Pac-Man, allowing you to stay ahead ofhim, albeit for a short period of time. Clyde (orange) and Inky (blue) can be called brothers, as they essentially work in the same way. Clyde prefers vertical travel, usually from top to bottom, though he does make turns on occasion. Inky is the same, save for his preference for clockwise or counterclockwise travel and his more pronounced tendency to turn. Funky (green) is a chain-ghost character, and he only moves horizontally, before turning left as much as possible. Glitchy (black) appears like several black pixels with random numbers and letters. He’ll make a surprise appearance in the maze at times, and as long as he’s a glitch, you can feel to ignore him problem-free early in the game. Watch out for his ability to disappear at random, typically fueled by his desire to avoid Pac-Man. Pinky won’t move until she spots you, upon which she’ll zip at you in a straight line; this also means she will only attack you if she can see you directly. Speed is faster than Pac-Man’s, but only when he’s in her line of sight. Spunky (gray) also attacks only when Pac-Man is near, and tends to sleep a lot. It’s easy to get away from him, as he can chase you for five seconds before going right back to sleep. Sue (purple) is actually several purple ghosts in a chain, and that makes her slow. Very slow. But she can block Pac-Man from a good distance so you shouldn’t take this chain of purple ghosts lightly. If you decide to use a continue with a credit, there are a couple good things that would happen, sort of allowing you to transition to the redo of the previous level. Any ghosts that were bugging you earlier would be gone, while all power-ups or power pellets will stick around. You really want to be looking at the power pellet meter for the most part, followed by Pac-Man’s path, with the ghosts taking the least precedence. Anytime your power pellet meter runs low, the blue ghosts will tell you they’re almost set to return to normal by beginning to flash. Eating ghosts while on power pellet mode, however, will also result in a small part of your meter being restored. 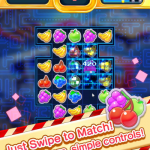 You can use any one of 16 power-ups in Pac-Man 256, and over time, you’ll unlock more of them by eating more pellets. We don’t have enough space to cover all 16 of the power-ups, but focusing on the really good ones, the ghost-killing power-ups are the best for beating old high scores. You’ve also got many later-level power-ups that are merely enhanced versions of those you may already have. For example, the Twinado power-up is simply Tornado on a higher level. Shattering stalagmites (with the Shatter power-up) will get you 150 each, and that could lead to some big-time scores, with a multiplier corresponding to the number of stalagmites you destroyed.